Mission Vertical/Sloped Display - Cal-Mil Plastic Products Inc. These cylinder displays are perfect for any party, buffet, or catering event. 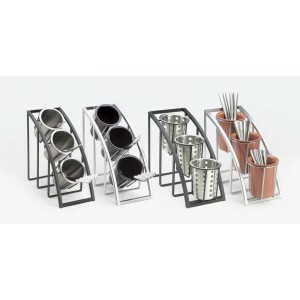 Cylinders sold separately, are offered in a variety of colors and materials for your choice of displaying flatware or condiments. It elevates and creates space to any table while adding a new and modern look to any event. Used for condiments or flatware.